All Hail the Thunderbird - "All Hail The Thunderbird Part 5"
I don’t know, should I tell you a very personal story? Shoot, why not? You already read all of the strange notions that pour out of my head onto the comic page, and you know I’m an adult who plays with toys. I can really relate to Ronald here. When I was a young teen, I became so concerned with body image that I mostly stopped eating. I shrunk down to a bag of bones and thought it looked awesome, because I thought “thin” equaled “healthy and attractive.” My parents were obviously terrified for my well-being, and could not convince me to please eat a damned sandwich, so they tricked me. They told me they were driving me to see yet another therapist, yet I learned when we arrived that they were actually dropping me off at a mental health facility. And I wasn’t leaving until I got better or the insurance ran out. Thus began one of the best experiences of my life. I kid you not. Unlike Ronald, I quickly accepted the situation ( at least that’s how I remember it). I realized that I had gone too far and was wrong, yet it still pained me to eat a full meal or not sneak in push-ups whenever no one was watching. I was confined to a wheelchair until I put on enough weight. That wasn’t the good part. The good part was that I was surrounded round-the-clock by kids my age. Whereas I had always felt like an outcast at school, I naturally became a part of this large, diverse group – even popular! Sure, we all had serious problems that had led us there, but we faced it all together. I think that kind of experience somehow put everyone on a level playing field, and you had to socialize in a specific space, so connections formed that might not have elsewhere. When the insurance did run out after two months, and I was mostly better and had been allowed to walk again, I didn’t want to leave. I had to say goodbye to my friends, and I was not supposed to keep in touch with them. However, my naive younger self thought this new social situation would carry over into my life outside, and that my everyday existence would be better. I was sadly mistaken. Back at school, I quickly went back to feeling unnoticed and rejected. This continued into high school, and (to my regret) I never went to live in a dorm at college. While I’ve always been blessed with a handful of great friends, the distance and separation that’s just been there as long as I can remember persists into the present day. Except for that one time. It’s sad to say, but I sometimes wish I could go back and relive those two months, or to try and take more from it that I could apply in the years going forward. The life-threatening reason I was there seems almost incidental, even though I’m certain that facility (and my parents) saved my life. The social experience was what really mattered to me, and it at least proved that it’s within me somewhere to meld into a larger group. It just took being locked inside a hospital wing to do it! I own the fact that I could have tried harder over the years, even if it felt like the deck was stacked against me. When I think back on that time at the hospital, it does feel like an alternate universe, another life that carried the fresh scent of a new beginning. So Ronald, don’t overlook this opportunity. Even when the demon you face is a giant, hungry Thunderbird! One of my favorite obsessions is the legend of the Lost Thunderbird Photo. It’s a convoluted tale that reveals more twists the further you dig, but here is a simple synopsis of the basic story: In the waning days of the American Wild West, two cowboys were accosted by an enormous flying creature and shot it dead. They hauled the beast – described in different versions of the legend as an abnormally large bird of prey or a prehistoric pteranodon – back to town, where the creature was hung across a barn wall. Several men posed side-by-side, demonstrating the monster’s enormous wingspan, and a photograph was taken of this momentous event. This photo has supposedly appeared throughout the following decades in various men’s adventure magazines and books on the paranormal. Many people are absolutely certain they have seen this photo – have you? – but the kicker is that no one can find it today. Library archives have been scoured, but still the “Thunderbird” photo eludes us. If found, it would surely be evidence of the incredible in our midst, more than a century distant but still documented in one murky, mysterious image. 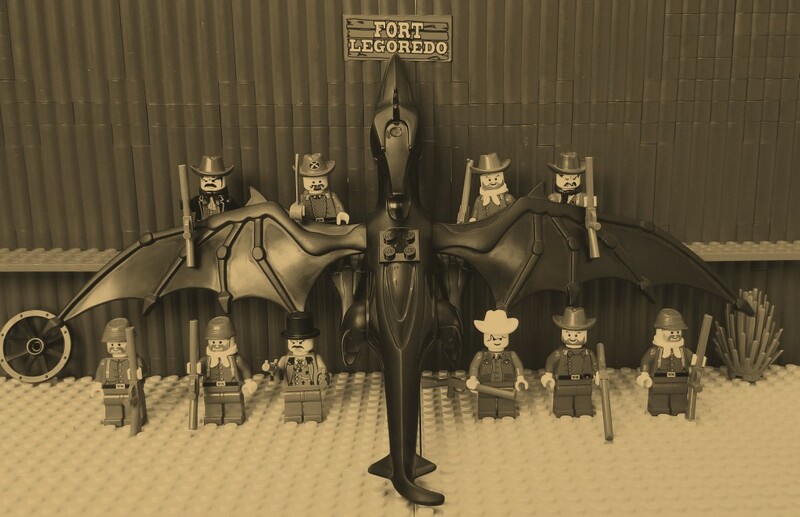 Believe it or not, the first part of this story – about cowboys shooting down a flying beast – has been located in the form of a news story that appeared in the April 26, 1890 edition of the Tombstone Epitaph. The story unfortunately did not include a photo, and ended at the point where the cowboys were planning to bring the creature back to town. The notion of a photo, while potentially implied in the Epitaph report, seems to have originated in the pages of mid-20th Century magazines about strange phenomena. So what makes this legend so compelling? The original news article is a shocking read, but it’s from an era when editors weren’t unknown to publish tall tales in their papers. Also, why are so many people SURE they’ve seen the Thunderbird photo? I think there’s merit in the idea that it’s a false memory, an example of The Mandela Effect. The description of a tintype photo showing a giant bird or pterodactyl draped across a barn and surrounded by a posse is evocative enough to implant an image in the brain, one that feels very familiar yet years removed. Deep down, we want to believe it’s real. And we desperately want to find it. It’s a key to another, more fantastic version of the universe. Of course, what if there is a kernel of truth, and the Thunderbird photo is still out there in the dusty pages of a magazine that’s been rotting in an attic for 60 years? But seriously, have YOU seen the Thuderbird photo? Let me know in the comments! The missing Thunderbird photo could depict either an abnormally large bird of prey or a long-extinct pteranodon, depending on the eyewitness account. 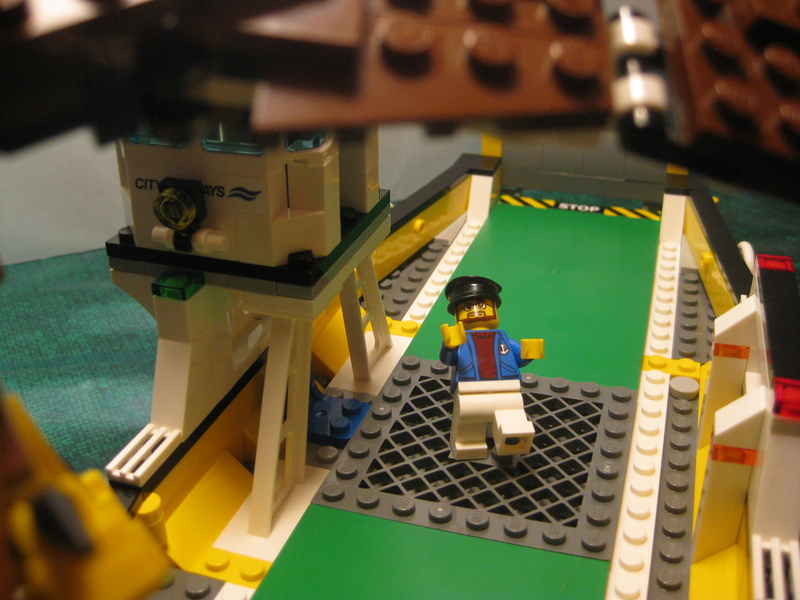 When I started shooting this storyline, it actually featured a different Thunderbird – the bald eagle from the LEGO Creator Fierce Flyer (#3100) set. You can see a glimpse of this below. 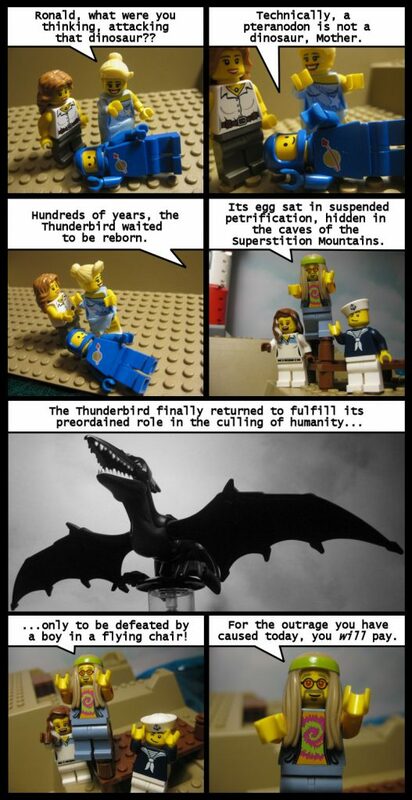 But I initiated a quick casting change after I discovered the LEGO pteranodon featured in this comic. Not only did it look cooler, in my eyes, but it had an opening beak, permitting the option for the graphic mayhem you see today! I posted a bonus Wednesday comic last week, so skip back if you missed it. In fact, I think I might try switching from one usually long comic per week (on Sunday) to two shorter comics a week (on Sunday and Wednesday), at least for a while. I received some feedback recently that my comics are too long and the dialogue too dense, factors which make reading them a chore, especially for new readers who are unfamiliar with the ongoing story. That feedback supports the mild to negative reception the comic gets on Reddit. My shorter strips tends to perform better. I think many causal readers are used to brief, gag-based comics. SPACE: The Comic is never going to be that, but I do think I bury some good jokes and moments in longer comics. I also view each comic more like a scene in a movie, or a long comic book page, than a singular punchline-based strip. I also don’t think more updates per week is a bad thing! I’m glad I made the decision to post two comics a week instead of one for the rest of this storyline. I had way too much planned for each page, and this gives me a chance to showcase the specific action shots. I really like the way these ocean shots turned out. Skip back if you missed yesterday’s bonus comic! I wanted to offer a vague background for the Thunderbird, at least as the cultists see it. The Superstition Mountains seem an appropriate point of origin for the Thunderbird because of the modern legend’s Arizona roots and… have you ever seen the Superstition Mountains? That area has earned its name; it’s creepy and wonderful. As for the Thunderbird, it’s possible that its presence played a larger role in the comic’s overall story than “random monster for the hero to fight.” We’ll see.